Has anyone gone to the craft store and bought round embellishments or brads lately? The price you pay is way too much as far as I'm concerned. 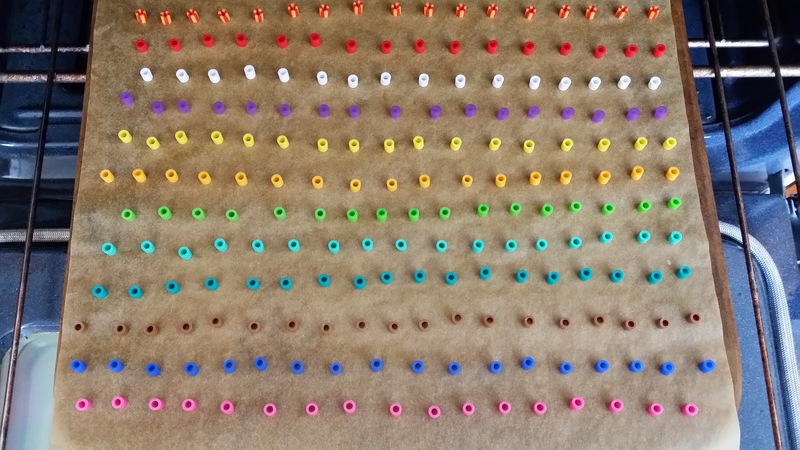 I read a post on how people were making round embellishments with Perler beads so I took myself to the store and bought some (well, I bought a lot of beads as I fell in love with all the colors!). This was like the easiest thing to make that I spent all day baking and making these cute embellishments that in the long run will save me (and you!) lots of $$. I made my embellishments in my Pampered Chef stone baker, but you can use any cookie sheet or even silicone baking pans. I first cut out a piece of parchment paper big enough to cover my pan. Make sure your paper is as flat as possible (the flatter the better). Start laying your beads one by one on the pan. I left about half inch between each bead for expansion as it flattens out. Set your oven at 350 degrees. I found I did not have to pre-heat the oven to do this. Some instructions online tell you to use pony beads.......don't. Use Perler beads from EK Success. Pony beads when heated give off a toxic and the smell is horrible. 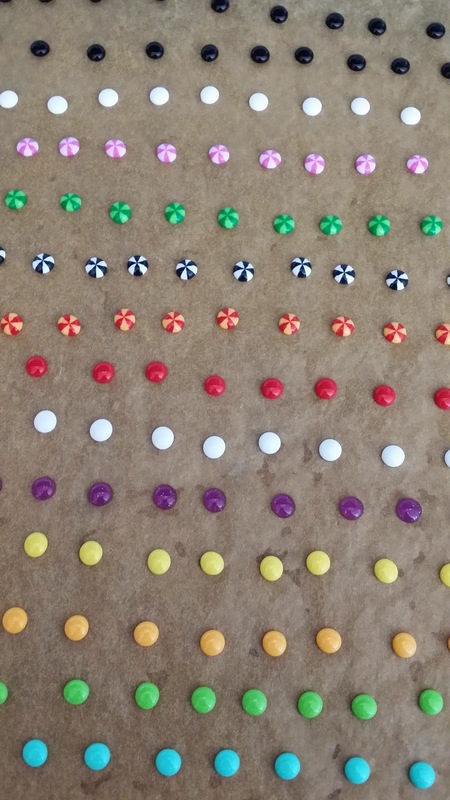 Perler beads are made for melting and there is no smell associated. 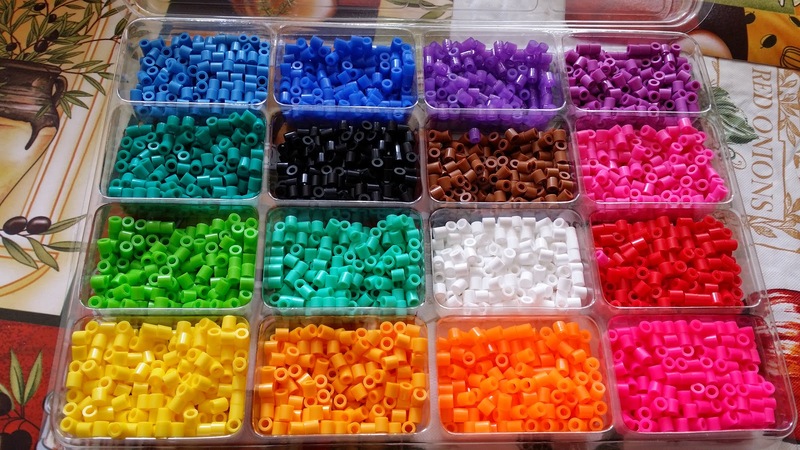 As you can see from the picture below, I bought every color bead I could get my hands on. 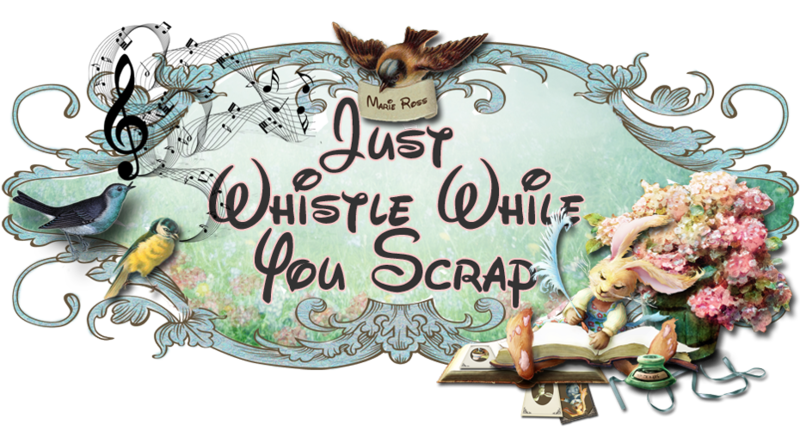 There are located in the kids craft section of any Michael's, Joann's or any other craft store. You can buy each color individually or in kits that incorporate more colors. I decided on a kit since I wasn't sure what colors I would end up liking or what colors worked when baking and melting. I baked them at 350 degrees for roughly 35 minutes (this included pre-heat since I didn't do that). The results were nothing short of amazing. Play around with your oven's temperature and decide what is best for your type oven. The bead needs to melt round and without a hole. If you find the bead still has a hole in the middle, let it melt a bit longer. Some posts have the temperature higher at 400 for 15-20 minutes. See what works for you, but I would start at 350 and work from there. The results were amazing. 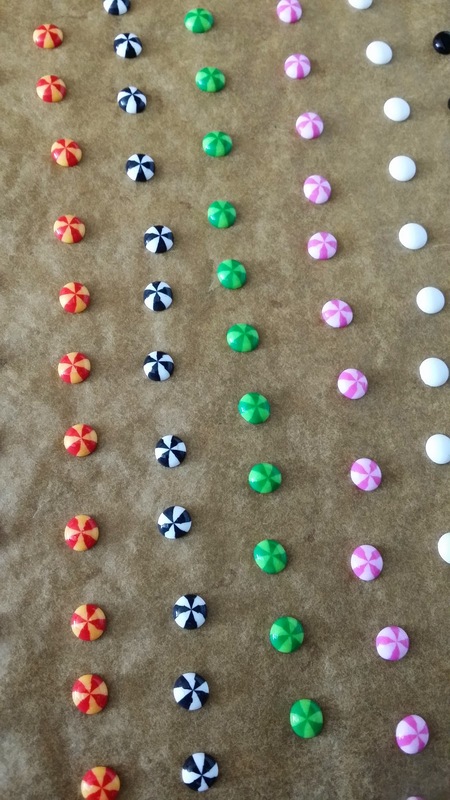 The finished, baked beads are round and glossy with a flat back and give dimmension to a page. You can adhere them with Glossy Accents to just about anything. Look how cute the "striped" beads came out! The purple ones (above picture, underneath the white ones) are glittered, but give off a transparent look. Like I stated above, I made hundreds in one day and still have hundreds left. The amount of $$ I have saved in buying future brads and round embellishments is enough to justify this project. Easy, fast and fun. I suggest you all try this for yourself and then comment below. Comment as well if you have tried this and tell us what your results were. Enjoy!